Students must pay the registration fee and finish course enrollment during the registration period. (1) When students miss over 1/4 of total classes due to unavoidable reasons such as illness, they can take a leave of absence by submitting a Request for Leave of Absence to be approved by the President. (2) The period of absence cannot exceed two semesters in a row and cannot exceed a total of three semesters in the case of the Master’s Program and a total of four semesters in the case of the Doctoral Program, but the years spent in military service are not counted in this case. (2) Returning to school after military service is allowed within one year of dismissal from military service, but when the dismissal date from military service falls within the 1/4 date of class days, returning can be approved despite stipulation (1) above. Those who want to resign should submit a Voluntary Resignation Form co-signed by a guardian and approved by the President. (i) Those who have not returned in the semester subsequent to the expiration of a leave of absence. (ii) Those who have not completed the required registration during the registration period in each semester. (iii) Those who have not completed the required courses within the total term of study allowed. (iv) Those who have been punished by the Graduate School Committee. Those who oppose a dismissal decision by the Graduate School Committee can file for Redeliberation no later than two weeks after dismissal notification. When students currently in the Master’s Program want to transfer to other departments, they can do so after obtaining a grant by the Graduate School Committee and final approval by the President. The deadline for such a transfer should be within two semesters after admission. 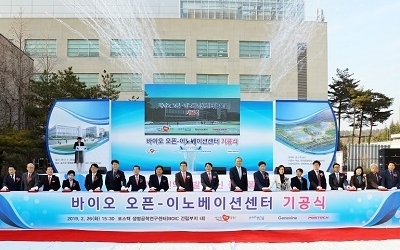 - Genexine, ASU, and over 20 pharmaceutical institutes to move into the BOIC- Initiative launched to build the first Cell Membrane Protein Research Institute in KoreaPOSTECH cut the first sod on the s..
JoongAng Ilbo Ranks POSTECH 1st in Innovation and Engi..
Polaris3D showcases self-driving indoor robot solution..
POSTECH RICC – Conversation with music critic Lim Ji..